Tucked away in the Gateway Building on the corner of Pitt and Alfred Streets is Neptune Palace. “Neppi’s” is somewhat of an institution in the banking and finance circles. In typical Malaysian/Chinese restaurant fashion, the menu is extensive with at least 140 items to choose from. Having said that, there are a number of requisite dishes that we always order like the “Rusty Motorbike”, Seafood Sang Choy Bau, Kapitan Chicken and the Duck Pancakes. These are the reliable dishes that people come back for over and over again in the almost twenty years that this restaurant has been in operation. Post the roast chicken he made the other day, we decided to try and re-create a few of our favourite dishes from this restaurant. We liked the way they served their Duck Pancakes. Whilst most Chinese restaurants will serve mostly the skin and very little meat, Neppi’s is a little different in that there is a generous amount of fried duck meat and of course, a decent amount of crispy skin. I actually prefer the Mandarin Pancakes this way. 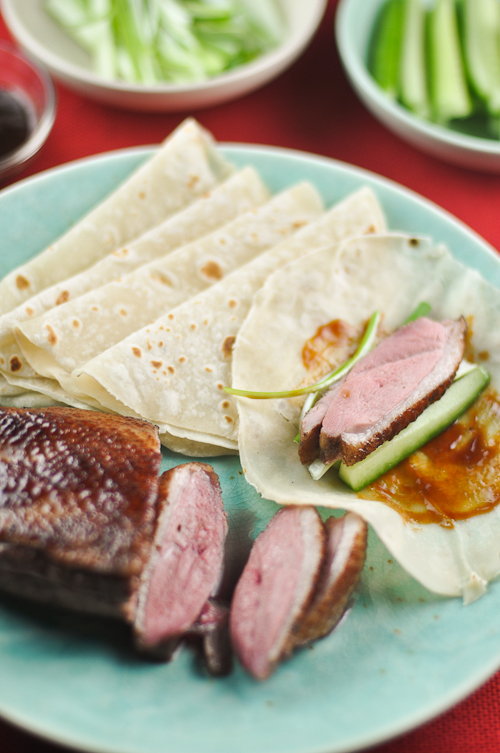 Rather than purchasing a whole duck, it made more sense for us to buy two duck breasts for this recipe. So we marinated the duck breasts overnight in a teaspoon of five spice powder, two tablespoons of maple syrup and two tablespoons of soy sauce. Then we sous vide the duck breasts at 57c for an hour and finally pan fried skin side down to get it all nice and extra crispy. In the meantime, we prepared the Mandarin Pancakes (recipe below). My husband is proving to be a better cook that I imagined! To serve, we sliced up some of the duck, whilst the rest, we diced and fried it a little bit more. The dishes we order at Neppi’s remind me sometimes of the very good friends I have. There are over 140 dishes in the Neppi’s menu but we keep coming back to the dishes we know we can trust. Similarly, of all the many friends I have, there are only a handful that I know I can rely on, no matter what. Place the flour, water and salt in a bowl of a stand mixer and using a dough hook, turn on to medium speed until the dough comes together in a ball. Remove the dough from the bowl and knead lightly on a lightly oiled surface for around 5 minutes until the ball of dough is smooth and springs back when pressed. Place the dough back in the bowl and cover with a damp cloth towel and allow to rest for 30 minutes. When the dough has rested, place it back on a lightly oiled surface and cut the dough in half. Keep one covered with a damp cloth and roll the other half into a long sausage. Cut the dough into 10 equal pieces. Press each piece down with the palm of your hand and then brush each piece with sesame oil. Place one piece of dough on top of the other so that the oiled sides are facing each other and then roll each pair of pancakes out to a diameter of 10 cm. Repeat with the rest of a pieces. Now, do the same with the rest of the dough. Place the rolled pieces of dough on top of each other in a plate and cover with a damp cloth. Heat a frying pan over medium heat. Place the pancake in the pan and dry fry for around 20 to 30 seconds or until you can see faint brown spots start to appear. You will also notice the dough puff up as it cooks. Flip the pancakes to the other side to cook again, another 15 to 20 seconds. Remove the pancakes from the heat and carefully pull them apart after a minute or so (allowing the pancakes to cool down a bit). The pancakes can be stored on a plate covered with a damp cloth before serving. They can also be stored in the freezer and heated in a warm oven before serving. 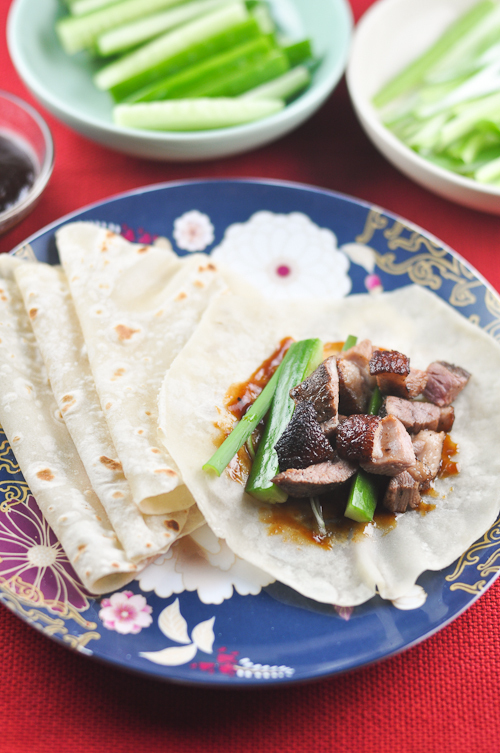 To assemble, lay a pancake on a plate, spread over with hoisin sauce, sliced of green onions and cucumbers. Your take on this dish looks great. Cooking duck has always scared me. This is one of mine and my husband’s faves too! But we have never even thought of attempting it at home…hmmm, the possibilities! Do you actually need need 255 ml of water at 70 degrees or so?